Priorities. We all have them. Since we all have them, that means we also struggle with them. My priorities often end up as a bracket full of face-offs. Studying for organic chemistry versus nutrition public policy. Journaling versus taking notes. Blogging versus studying. Going to the meeting or going to dinner with friends. Walking to class versus driving. Dating or friendship. “My priorities or your priorities? My will or your will? Suffering for the glory of My Son or suffering for comfort of your future career? God tells us to love through our actions (1 John 3:18). In this way, choosing our priorities is an action, and we show love through how we prioritize our day. When we choose God’s priorities, we show that we love Him more than we love ourselves. 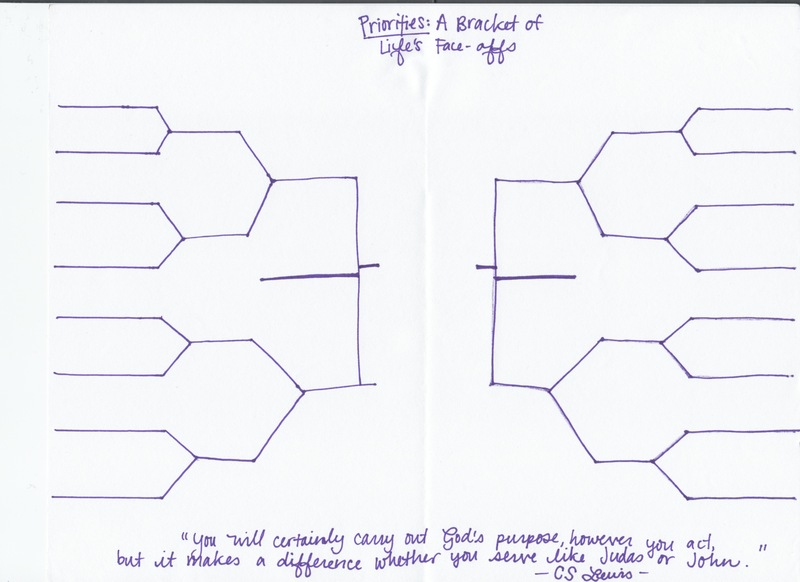 Today, click on the picture of the bracket and fill it with the priorities of your life. Be realistic in how you fill it out. After finishing your bracket, ask yourself, How am I carrying out God’s purpose with my life?